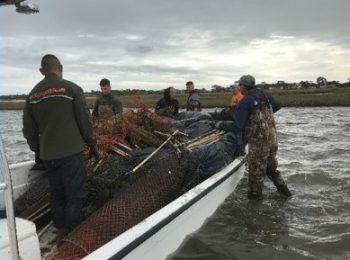 In March 2019, the North Carolina Coastal Federation along with partners, the National Oceanic and Atmospheric Administration (NOAA), North Carolina Sea Grant and commercial shellfish operations, wrapped up a two year-long project that removed almost 600,000 pounds of decades old mariculture operation debris from Carteret County waters. Volunteer groups with the federation, NOAA partners, and a local contractor, Brooks Dredging and Marine Construction Inc., removed pilings, plastic cages, buoys, netting, ropes, piping, sandbags, screens and other offshore and embedded aquaculture debris from an abandoned mariculture site near Harkers Island throughout 2017 and 2018. Before being removed, the debris was causing navigational hazards and littered local salt marshes, seagrass beds and oyster beds. The Duke University Marine Robotics and Remote Sensing research group monitored the site to help locate debris that could not be seen by land for removal and determine how the marsh recovered after being cleaned up. A key part of the project was the development of the North Carolina Shellfish Mariculture Best Management Practices (BMPs) for the Prevention of Marine Debris. This plan includes the most effective methods for preventing and reducing debris from mariculture operations. The shellfish mariculture industry heavily relies on placing man-made gear in the marine environment. Producers are aware of the negative impact that gear can have if it escapes the farm and want to be proactive in preventing that from happening. “These BMPs are a product of a unique partnership with commercial growers who acknowledge the marine debris risk from the industry and want to keep the environment they rely on clean and healthy,” said Bree Charron, federation coastal specialist in the central region. The BMPs cover siting, design and maintenance strategies for mariculture operations and provide new growers and lease applicants key information on how to keep gear on the farm during normal operations as well as in preparation for a storm. The BMPs and a fact sheet are available at nccoast.org/bmps. The project was funded by a grant from NOAA’s Marine Debris Program. For more information please contact Bree Charron at breet@nccoast.org or 252-393-8185.